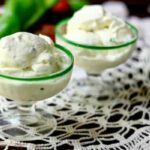 This Hatch Chile Gelato recipe is ultra-rich and creamy with the tangy flavor of key lime cheesecake and a zesty punch of smoky Hatch Chiles. Beat the egg yolks and sugar until thick and lemon colored. Heat the milk, cream, and cream cheese to a simmer, whisking until smooth. With the mixer running slowly add the hot milk mixture to the eggs. Pour the milk and egg mixture back into the pan and simmer until the mixture coats the back of a spoon. Blend 2 tablespoons of the hatch chiles to a paste. Whisk into the milk mixture with the lime juice and lime zest. Refrigerate until cold, about 4 hours. Add the cold mixture to your ice cream maker and freeze according to manufacturer's instructions. Add the remaining chopped Hatch Chiles to the mixture when it's solid but still soft - about halfway through. Store, tightly covered in the freezer. *Regular lime juice may be substituted for the Key Lime juice if necessary.